There are a number of popular shower options available enabling you to choose the style and design that works with your overall bathroom design. A shower shouldn’t be that inconvenience in the bathroom, but rather a bathroom item that enhances the space, blends in with the rest of your design and offers you convenience and functionality. Many of us have the trouble of trying to design a small bathroom. It seems that homes are being built on a smaller scale which leaves us with a small family bathroom and once you place a bath in these spaces there isn’t much room for anything else, which is why we choose showers. In a smaller bathroom space most people choose to place the shower in the corner of the room, this way you maximise the floor space and leave ample room for all your other bathroom products. Placing the shower in the corner gives you a few options you can choose from. The first is the quadrant design. These shower trays are specifically designed for a corner position in either a square or rectangular choice with a curved from. The enclosures you have available are also designed purely for these trays which come with sliding doors, maximising your space even further. If you’re looking for a modern design you may not like the curve of the quadrant shower trays and may choose a square or rectangular shower tray where you can add the enclosure of your choice. Placing these showers in the corner means only two sides of the shower is wall and one wall is the shower door, you have a side open where you can use shower enclosure side panels to water tight the shower and have the design that best suits your overall bathroom style. If you are lucky enough to have a spacious bathroom then you have a large number of options available, you can place your shower in the corner as you would with the smaller bathroom design. Again you could use the square or rectangular shower trays, the enclosure of your choice combined with shower enclosure side panels to seal off the shower. Another option for larger bathrooms is you can place the shower along a wall, one side will be wall, the front will be the shower door and you can use shower enclosure side panels on two sides ensuring the shower is tightly sealed and reduce the risk of leaking. 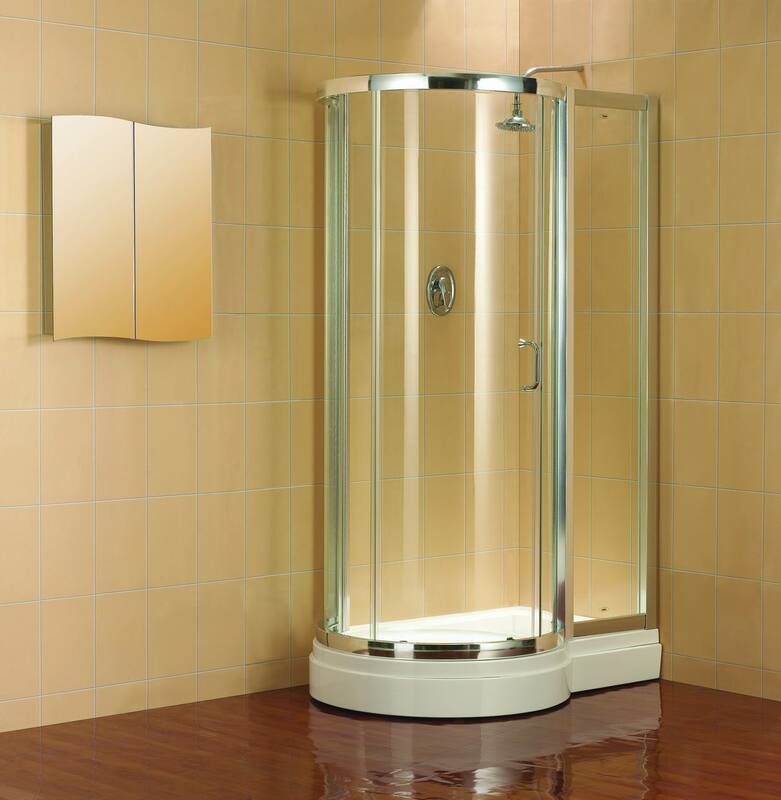 Quadrant shower enclosures are one of the most popular choices when it comes to shower designs. They add straight lines with seductive curves that work beautifully in both the compact and larger bathroom design. Before you even consider any shower you need to know the space you have to work with. The best tip I can offer is to measure your entire bathroom area before you think of renovating, once you have all your measurements in place you can start shopping for various bathroom items such as quadrant shower enclosures and trays, basins and toilets. Quadrant shower enclosures work beautifully in the corner of a bathroom, which is probably why they are so popular. 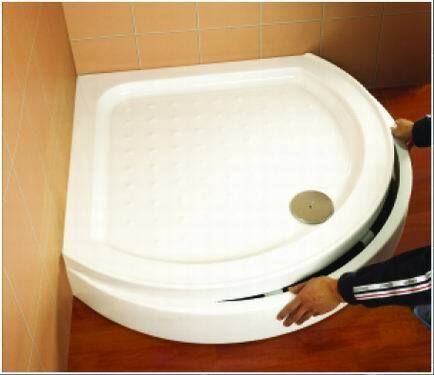 They give you the ability to maximise your floor space and help reduce the feeling that the bathroom is too cluttered. The design of these shower trays is rectangular or square with a rounded edge which makes them the perfect choice when choosing a shower enclosure for a corner design. You can choose your quadrant shower enclosures before you start planning the rest of your bathroom, let the design flow through the bathroom using straight edges or rounded ones to complement the shower. Use chrome taps and radiators to blend in with the frame of the shower enclosure and bring the entire bathroom together in one neat design that will make a statement in any home. Quadrant shower enclosures usually come with sliding doors which are a welcome addition to any bathroom. If you think about how you want your bathroom space to work, you don’t want the inconvenience of obstacles getting in the way of your shower door if it were to swing open, which is why sliding doors are often the most realistic choice. Smaller bathrooms definitely benefit from the quadrant shower enclosures with the sliding door system, this gives you ample room to move around your bathroom, dry off after a shower and makes the space look so much bigger than it is. Remember to lay your bathroom out so that your shower isn’t difficult to access, placing your toilet or basin in front of the shower will not offer you the practicality you were looking for, in fact it can be a huge mistake which makes the bathroom difficult to move around and leave you frustrated. So you are one of the many that are trying to remodel your very compact bathroom. As homes are built smaller these days, the one obstacle many of us face is the smaller bathroom. Even family bathrooms are built tiny these days which leaves us all with one obvious choice, a shower rather than a bath. Placing a shower in a small bathroom immediately frees up your floor space, giving you room to move around with ease without having to pivot on one foot. As you can imagine this is a big advantage. I think the hardest thing is trying to decide what type of shower to put into a compact bathroom, you look at the bathroom from every angle, you measure the space you have available and chances are you come up with the same solution after each measurement. A corner shower is the most logical and easiest solution for the smaller bathroom space. Right so you are standing in the empty shell of your small bathroom, staring blankly and trying desperately to vision what it will look like once you have your shower, toilet and basin in place. Now what? Well you need to choose your shower enclosure. I doubt I need to mention this, but it’s obvious when working with such a small area that a shower door which has to swing open is not a practical solution for a room this side. You need quadrant shower enclosures that are designed specifically for corner showers and where the doors roll open on rollers, so you don’t have to worry about keeping space available for the door to swing open. The frustration comes in when you are trying to vision the bathroom. Once you have measured up and everything starts going in and taking shape, you will be thrilled with the choice you made. Every day thousands of households across the UK are in the same situation that you are, they all struggle with their bathrooms and have to make difficult decisions regarding the layout to avoid compromising the floor space. Quadrant shower enclosures are not only the most practical options for the smaller bathroom, but they are stylish and offer an elegant addition to your bathroom space. Make from glass with a chrome finish, they can complement the space, offering a modern feel and making the area spacious as the doors slide easily back and forth offering ample entry in and out of the shower.